Almost everyone has gone through the unpleasant experience of dealing with an acne attack. It can be quite infuriating and burdensome, especially if you want to go out or you have a special occasion coming up. Fortunately, there are easy ways to deal with the problem. Hormonal changes during puberty - One of the most common causes is hormonal changes within the body, especially if there is a testosterone surge. These changes are usually experienced around puberty; thus, teens are most often affected. Menstruation or menopause - Women can get acne before or during menstruation, as well as during menopause, due to changes in hormonal cycles and levels in the body. Pigmentation - Excessive pigmentation can also cause acne, and those with oily skin are at an increased risk. Blocked pores, leading to bacterial outbreaks and infections, are also causes of acne. Diet and hygiene - Eating oily or greasy food or lack of personal hygiene can further complicate the problem. Stress - Acne may be a psychosomatic reaction of the body to stress. The body’s natural response to stress also leads to hormonal changes, which may cause acne. In addition to being painful and itchy, acne is also detested for cosmetic reasons. It can give your face a bloated and patchy look. Also, it can be very uncomfortable if there are pimples on your back, which can lead to problems in sleeping and choosing clothes, especially during the summer. Acne may also lead to scarring if picked. The scars remain for a long time and can be difficult to get rid of. People very often go for over-the-counter drugs or creams to treat acne. The problem is that many of these are chemical based and may exacerbate the problem. However, if you have a severe outbreak, consult your doctor for any recommended drugs. 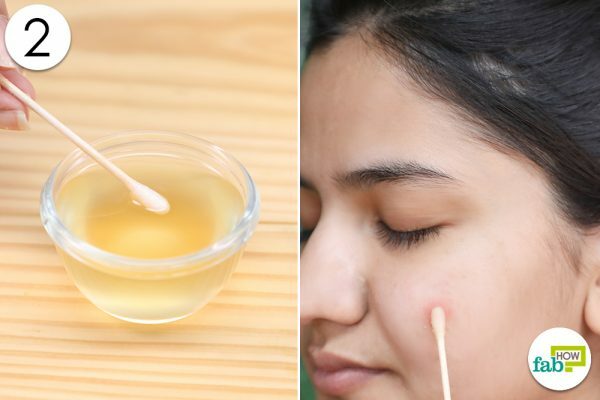 For mild acne, there are several home remedies that you can use. Apple cider vinegar is one of them. Note: Please do a patch test before applying any of the remedies on to your skin. Some of the ingredients may not suit every skin type. In case of a burning sensation or itching, wash your skin with water immediately. 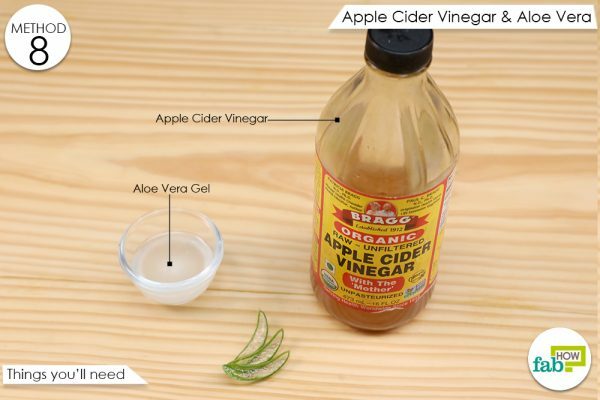 The following article enumerates the ways in which you may use apple cider vinegar for acne in various combinations. You can apply apple cider vinegar directly on the acne. It is rich in organic acids and is shown to be effective in fighting against acne-causing bacteria. An added advantage of apple cider vinegar is that it’s also effective in removing scars, which are often an unpleasant consequence of acne. The acetic acid in the form of vinegar has been used for medicinal purposes since ancient times. 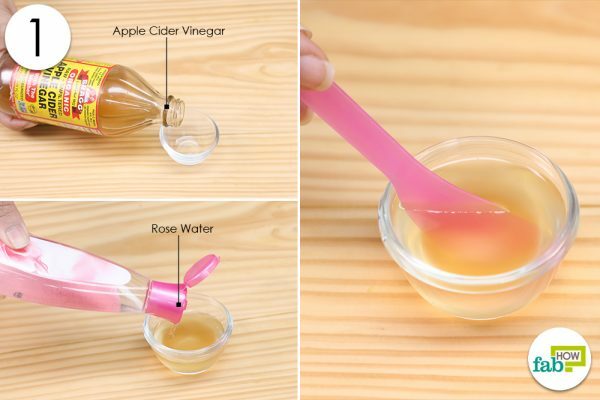 Dip a cotton swab in raw, unfiltered apple cider vinegar. Apply it on the acne. In addition to its acne-fighting properties, it is also helpful in weight loss, in fighting yeast Infections, and for the general health and appearance of your skin and hair. Rose water is very helpful in dealing with inflammation and bacterial infections. It is most commonly used for cleansing and toning. The skin health properties of the rose family are attributed to their abundance of phenolic compounds. Phenolics have a wide range of pharmacological activities, such as antioxidant, free-radical scavenging, antibacterial, anti-inflammatory, and wound healing. Combine 1 tablespoon each of raw, unfiltered apple cider vinegar and rose water in a mixing bowl. Use a spatula to blend the ingredients. Use a cotton swab to apply it on your acne spots. Once applied, this solution can be left on for 1 to 2 hours. After that, rinse your face with water and pat your skin dry. Honey is revered as a natural antiseptic and is hailed for its bacteria-fighting properties. It disinfects the skin and prevents harmful microbes from multiplying. It also has hydrating properties and can be used as a remedy for dry hair and skin. Since ancient times, honey has been a versatile natural substance that is appreciated for its therapeutic abilities. Pour some raw, unfiltered apple cider vinegar into a bowl. Add an equal amount of honey to it. Mix the two together, until the honey dissolves completely. Use a cotton swab to apply the mixture on your acne. Lemon juice is said to be a natural astringent, which helps fight acne by ridding your skin pores of excess oil. Due to its acidic properties, it is used as an antibacterial and antiseptic substance. It can also remedy scarring. Note: Please perform a patch test on a smaller area before trying this remedy. 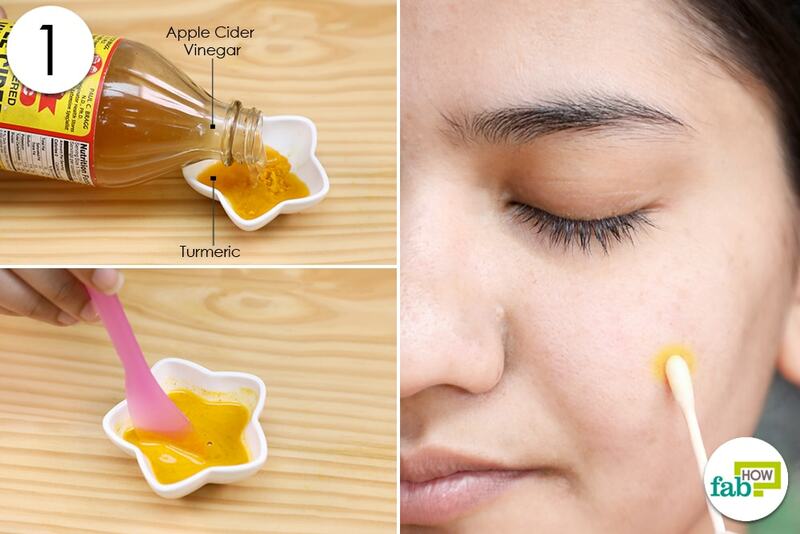 Adding apple cider vinegar and lemon juice treatment to your skin care promotes healthy skin. Pour 1 teaspoon of raw, unfiltered apple cider vinegar into a bowl. Apply the solution on the affected area using a cotton swab. Leave it on overnight. Rinse and pat dry the area in the morning. Baking soda helps fight acne by removing excess oil and dead skin and unclogging your pores. It has anti-inflammatory properties and reduces itchiness and redness. It soothes the skin and maintains its pH balance, due to its alkaline properties. Note: Baking soda may cause itching. It is advised first to apply it on a small patch of healthy skin and check for any adverse reaction. 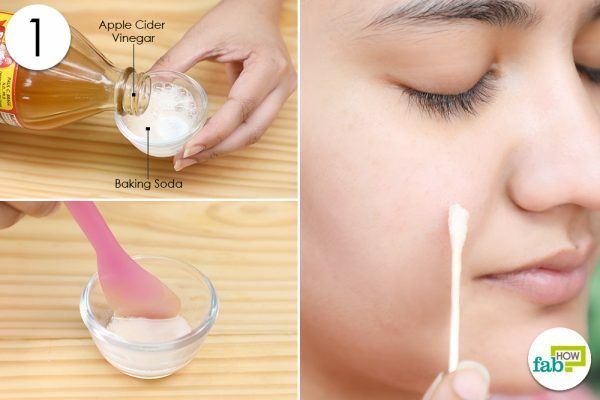 Another way to use apple cider vinegar for acne is to prepare a paste of apple cider vinegar and baking soda which also promotes a balanced fresh-looking complexion. Put 1 tablespoon of baking soda in a mixing bowl. 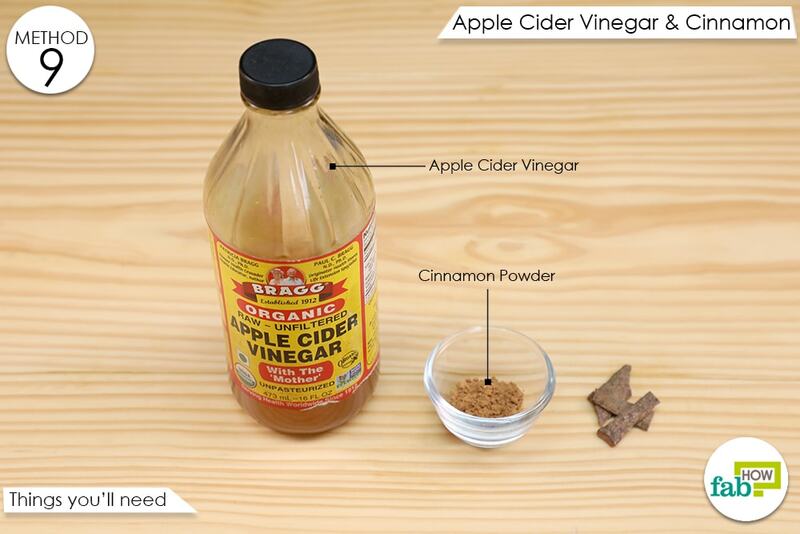 Add 1 tablespoon of raw, unfiltered apple cider vinegar to it. 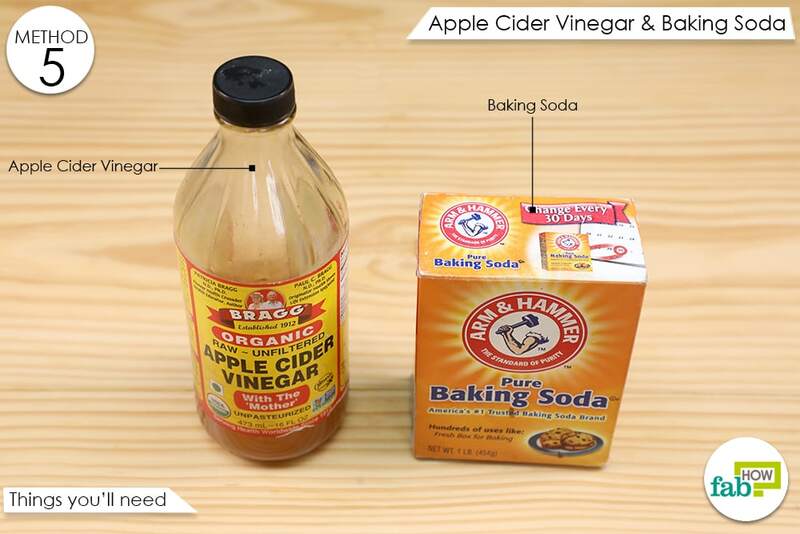 Mix the ingredients until the baking soda dissolves completely. 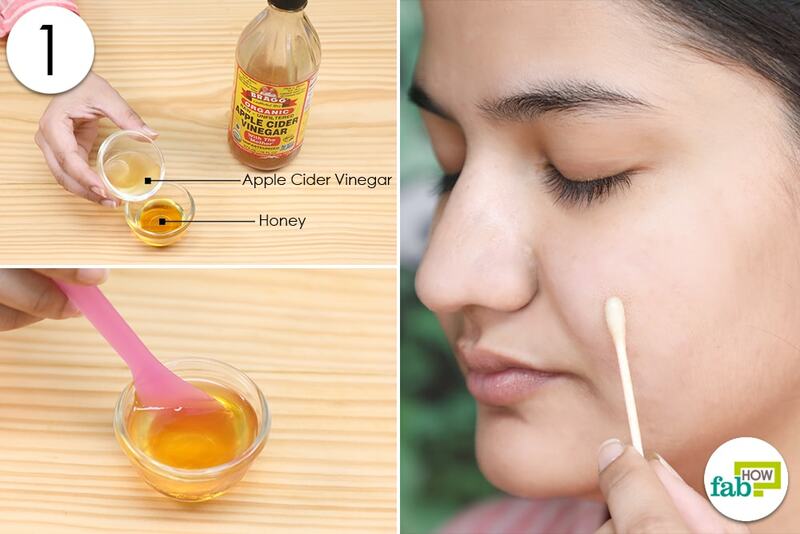 Apply the solution on the acne using a cotton swab. Leave it on your skin for 15 to 20 minutes and then wash and dry your face followed by a moisturizer. Applying moisturizer is highly recommended as both apple cider vinegar and baking soda cause dryness. Turmeric has numerous medicinal and antiseptic properties. It helps to fight bacteria and germs and reduces infections, redness, and inflammation. It also reduces scars because of its skin-lightening properties. Apple cider vinegar and turmeric offer a powerful skin care treatment when made into a paste and used as a face mask to prevent acne outbreaks. Note: Turmeric may leave your skin slightly yellow depending on the quality of turmeric you use. You may simply wash your face with a gentle face wash to get rid of it. Put some turmeric in a bowl. Pour an equal amount of raw, unfiltered apple cider vinegar into it. 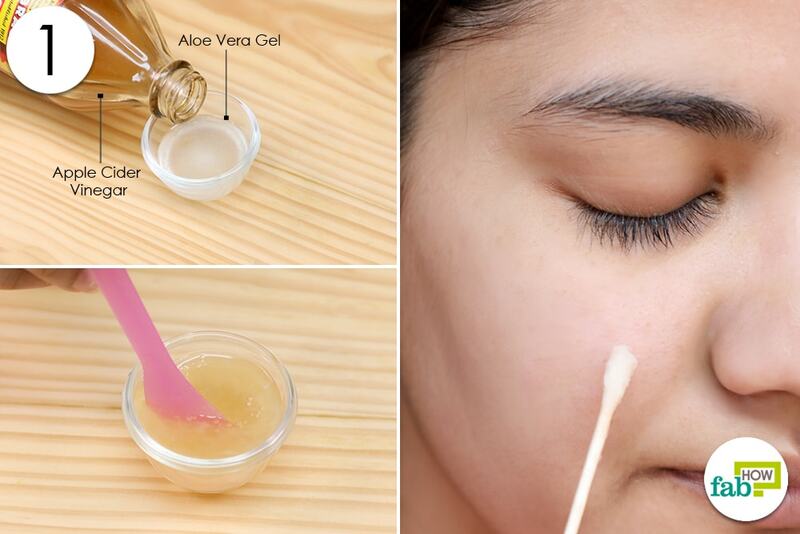 Dab it on the acne using a cotton swab and let it dry for 10 to 15 minutes. Wash and dry your skin using a clean cloth and apply a moisturizer. This remedy can be used once a week. Tea tree essential oil is beneficial in fighting acne, mainly because it is antimicrobial and antibacterial in nature. It clears blocked pores, disinfects the skin, and reduces pain and itching. 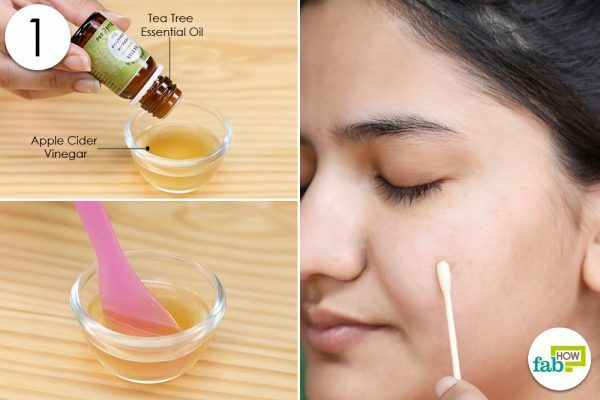 Tea tree oil is an ancient and effective remedy for acne and is widely used for medicinal and commercial applications. Note: It is recommended to test the remedy first on a smaller, less sensitive area before applying it to your face. A bonus for using tea tree is its ability to help restore the hormonal balance of the body and cure insomnia. 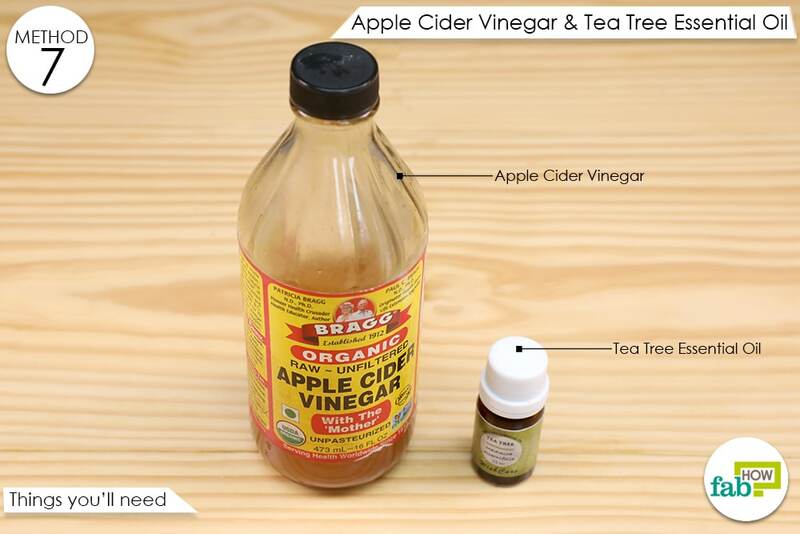 Pour 1 to 2 tablespoons of raw, unfiltered apple cider vinegar and a few drops of tea tree essential oil into a mixing bowl. Mix the two, using a spatula. Apply it on the acne and leave it on overnight. Aloe vera has a wide range of medicinal uses because of its ability to get rid of bacteria and microbes. 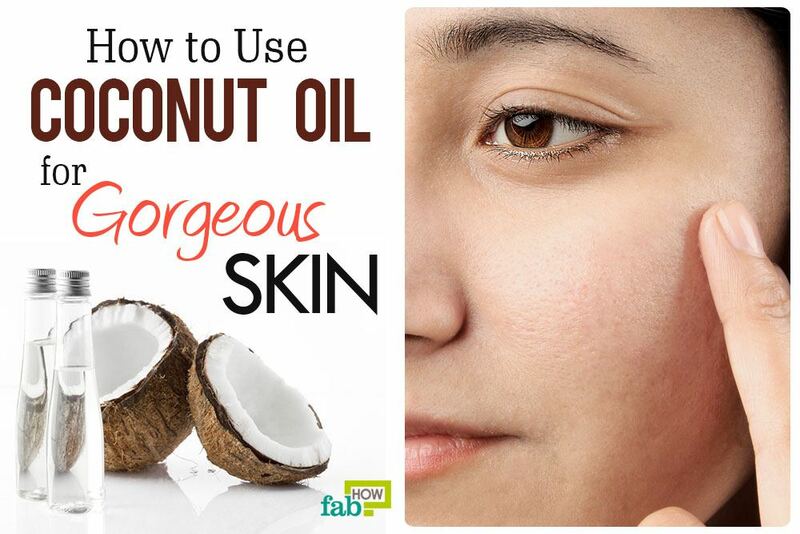 It also absorbs excess oil, cleanses the skin, lightens the skin tone, and helps remove scars. One added advantage of using aloe vera is the presence of magnesium lactate, which is very effective in reducing itching caused by pimples. Aloe vera is also known as medicinal aloe. It contains compounds including mannans, polysaccharides, lectins, and anthraquinones, which are extremely beneficial for skin health. Pour some raw, unfiltered apple cider vinegar and an equal amount of aloe vera gel into a mixing bowl. Apply the solution on the acne. Leave it on for 15 to 20 minutes. Wash and pat dry your face. 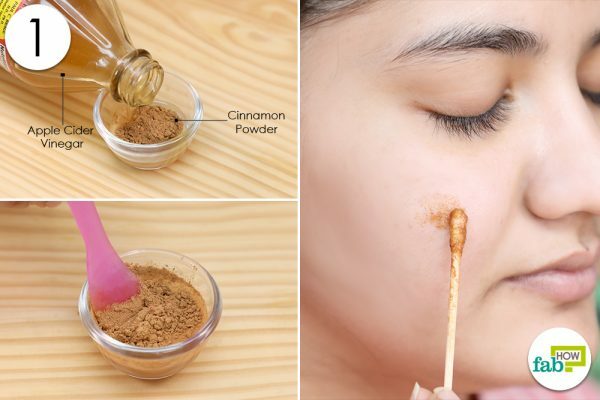 Cinnamon has antibacterial and anti-inflammatory properties and can be used to treat a wide range of skin problems, including acne, eczema, and scalp infections. Cinnamon is also rich in antioxidants and thus helps prevent the harmful effects of environmental pollutants and bacterial waste on the skin. Cinnamon has been used for centuries in traditional medicines for the benefit of maintaining healthy skin and as a remedy for acne, scarring, and various skin-related diseases. Note: For best results, it is mandatory to check if the ingredients used in the recipe suit your skin. Do a small patch test to know it. Put some cinnamon powder in a bowl. 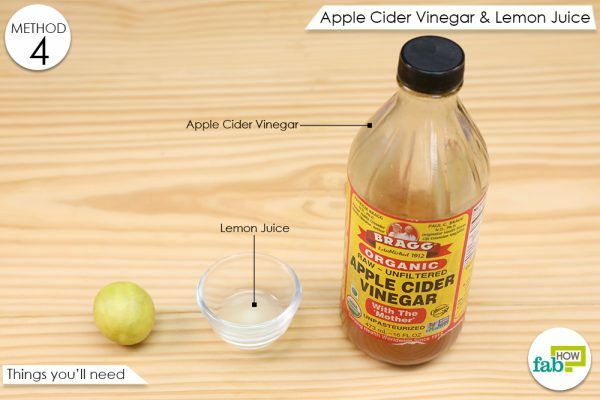 Add an equal amount of raw, unfiltered apple cider vinegar to it. Mix the two well and apply the mixture using a cotton swab. Rinse your face and pat it dry. 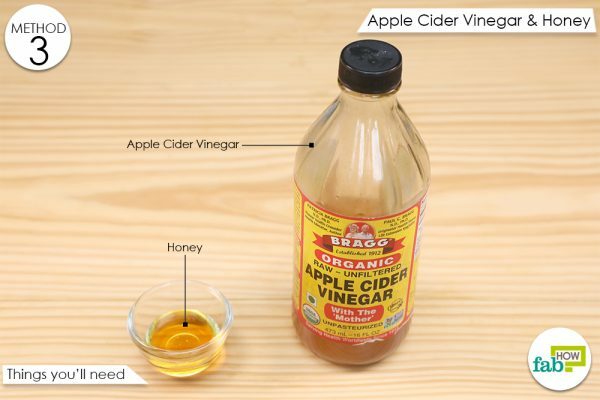 Apple cider vinegar should always be diluted, irrespective of whether you are applying it on the skin or ingesting it. The dilution should be above 50 percent. For any of the home remedies, first, apply the solution on a small patch of healthy skin to check for allergies or any adverse reaction. Rinse it off immediately if you experience itching or redness. 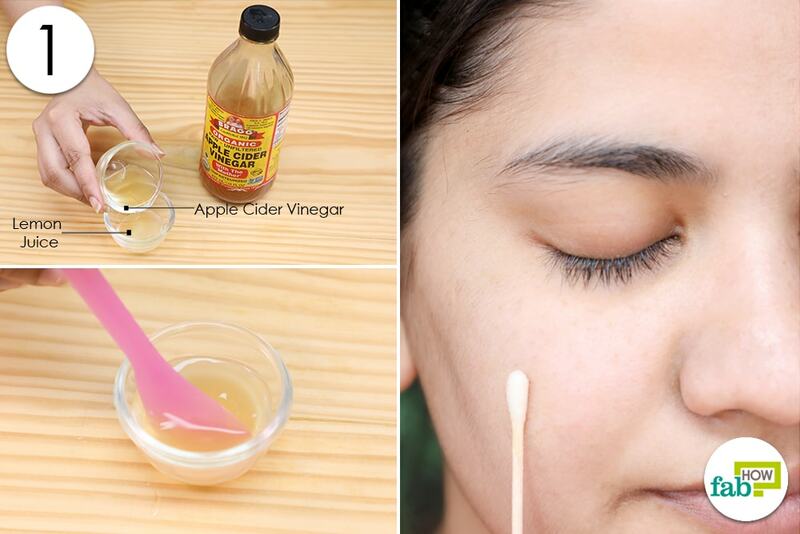 Apple cider vinegar makes you more sensitive to the sun. Therefore it is advised to use sunscreen when going out. Make sure to wash your face thoroughly before and after applying any of the solutions. 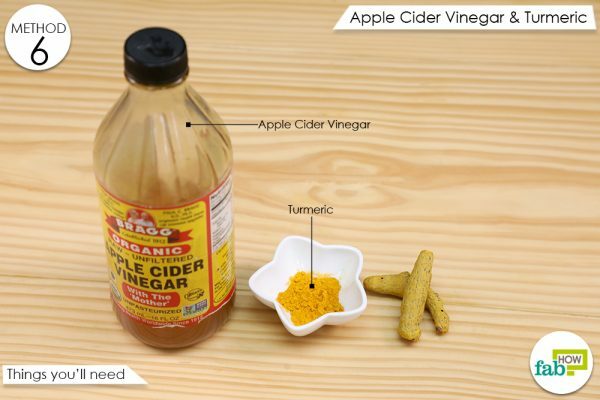 Do not apply apple cider vinegar very close to the eye, as it may cause damage. 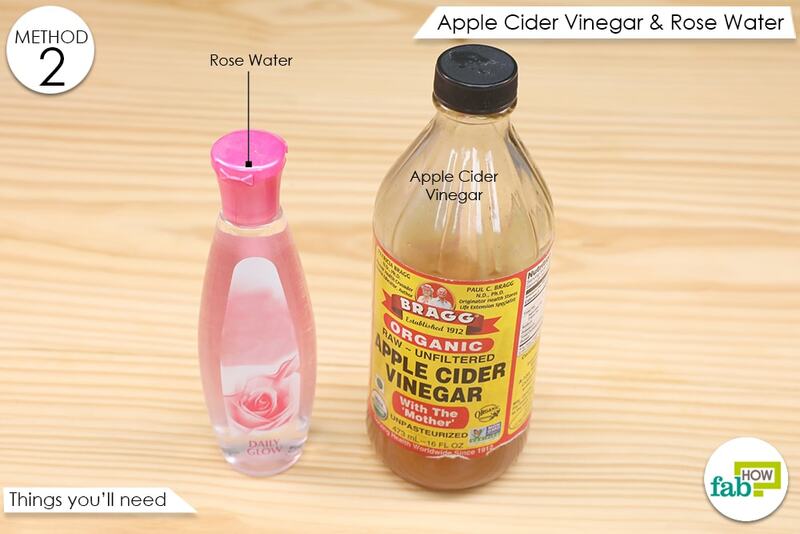 Apple cider vinegar has a strong smell. Although most of the combinations will help ward off its smell, try and apply it at a time when you do not have to go out. 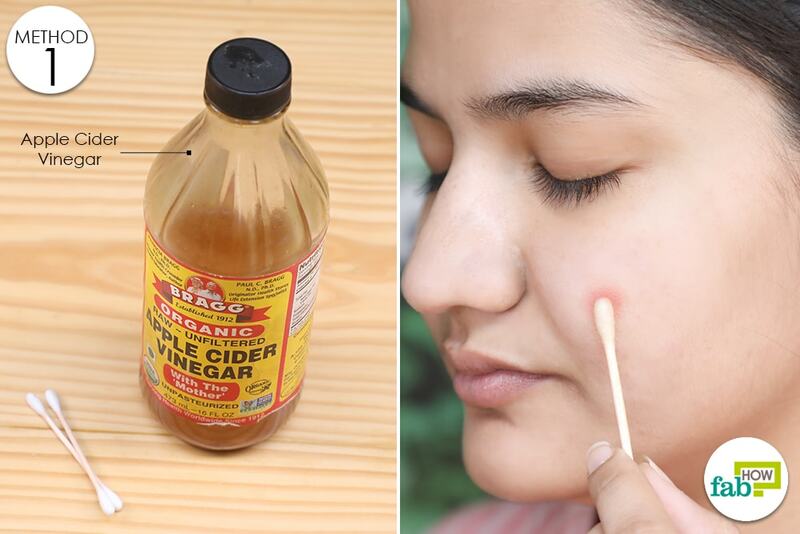 Applying apple cider vinegar directly onto the pimples may cause a stinging sensation. Always use a mild soap to wash it off your face. Applying moisturizer after washing your face is also recommended because a lot of these solutions can cause skin dryness. Substances like cinnamon, honey, and aloe vera have general benefits for the skin too and can be used as a mask. They can also be added to your diet to prevent outbreaks and for healthier hair and skin. Prodanovic E, Fosko S. Use of vinegar (acetic acid) to promote wound healing complicated by hypergranulation tissue. Journal of the American Academy of Dermatology. https://www.em-consulte.com/en/article/335317. Published March 2009. Khalisy M'an A-, Imam AA-. Commercial Acetic Acid: A Potential Regenerative Agent for Chronic Cutaneous Wounds? A Quasi-Experimental Study. Global journal of health science. https://www.researchgate.net/publication/319902816. Published September 2017. Catrin H. Chemical and sensory analyses of juice, cider, and vinegar produced from different apple cultivars. Chemical and sensory analyses of juice, cider, and vinegar produced from different apple cultivars. https://stud.epsilon.slu.se/2481/. Published April 13, 2011. Babilas P, Knie U, Abels C. Cosmetic and dermatologic use of alpha hydroxy acids. JDDG: Journal der Deutschen Dermatologischen Gesellschaft. https://onlinelibrary.wiley.com/doi/full/10.1111/j.1610-0387.2012.07939.x. Published May 11, 2012. Boskabady MH, Shafei MN, Saberi Z, Amini S. Pharmacological effects of rosa damascena. Iranian journal of basic medical sciences. https://www.ncbi.nlm.nih.gov/pmc/articles/PMC3586833/. Published 2011. Cianciosi D, Forbes-Hernández TY, Afrin S, et al. Phenolic Compounds in Honey and Their Associated Health Benefits: A Review. Molecules (Basel, Switzerland). https://www.ncbi.nlm.nih.gov/pmc/articles/PMC6225430/. Published September 11, 2018. Al-Niaimi F, Chiang NYZ. Topical Vitamin C and the Skin: Mechanisms of Action and Clinical Applications. The Journal of clinical and aesthetic dermatology. https://www.ncbi.nlm.nih.gov/pmc/articles/PMC5605218/. Published July 2017. Milstone L. Scaly skin and bath pH: Rediscovering baking soda. Journal of the American Academy of Dermatology. https://www.researchgate.net/publication/43181439. Published May 2010. Vaughn AR, Branum A, Sivamani RK. Effects of Turmeric ( Curcuma longa ) on Skin Health: A Systematic Review of the Clinical Evidence: Effects of Phytotherapy Research. Curcuma longa on Skin Health. https://www.researchgate.net/publication/303503087. Published May 2016. Enshaieh S, Jooya A, Siadat AH. The efficacy of 5% topical tea tree oil gel in mild to moderate acne vulgaris: A randomized, double-blind placebo-controlled study. Indian journal of dermatology, venereology, and leprology. http://www.ijdvl.com/article.asp?issn=0378-6323;year=2007;volume=73;issue=1;spage=22;epage=25;aulast=Enshaieh. Published 2007. Forest JM, Rafikhah N. Aloe vera Juice, and Acne Vulgaris: A Placebo-Controlled Study. Asian Journal of Clinical Nutrition. https://scialert.net/fulltextmobile/?doi=ajcn.2014.29.34. Published 2014. Mayaud L, Carricajo A, Aubert G. Comparison of bacteriostatic and bactericidal activity of 13 essential oils against strains with varying sensitivity to antibiotics. Letters in Applied Microbiology. https://www.researchgate.net/publication/26317183. Published September 2008. Ghovvati M, Afshari GK, Nasrollahi SA, et al. Efficacy of topical cinnamon gel for the treatment of facial acne vulgaris: A preliminary study. Biomedical Research and Therapy. http://www.bmrat.org/index.php/BMRAT/article/view/515. Published 2019. Please do a patch test before using it on your face. And do let us know how it turned out for you.